I have seen this brand on online shopping sites but honestly, I didn’t like this color as the chunky glitters on a brownish base looks quite dull and boring. Definitely not my type. I wish I could have received a red or a gold color. Loved this product. I can never have enough of lip balms and lip products so, this is great. I used this and liked it. This costs 345 rupees for 8 g which means this is a full sized product. I already have this White Jasmine facial masque in my shower. This has a clay base and jasmine extracts which makes the skin smoother and glowing. This costs 2150 for 100 g. Wow!! 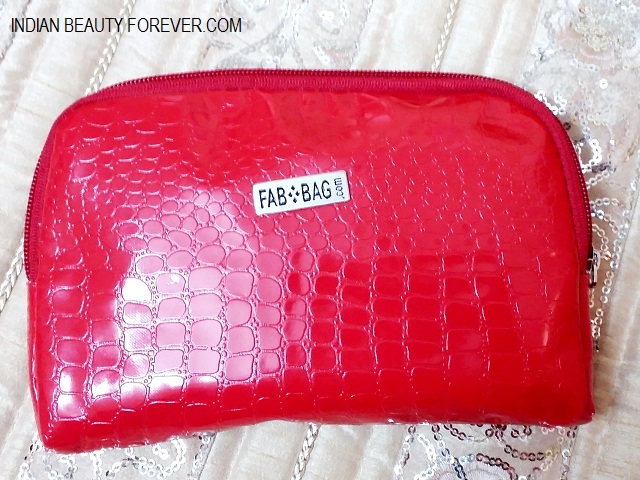 This is the product that I loved in this month’s Love and Makeup Fab Bag. 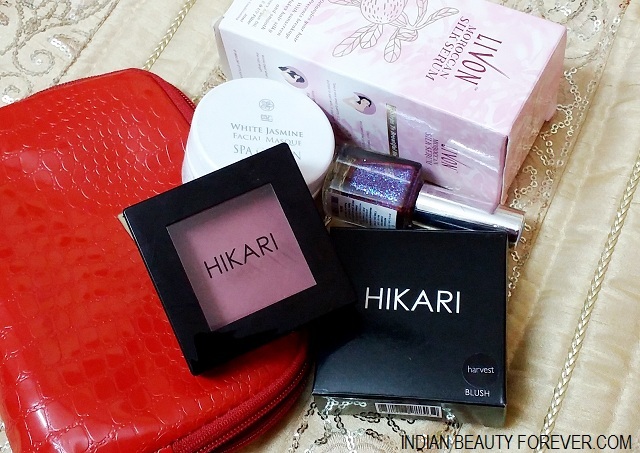 In fact, I was eager to see which HIKARI product will Fab Bag include in February bag as they have added HIKARI cosmetics too and after Sugar cosmetics, this is the brand that I would love to explore more. This costs 1000 rupees. I already had 3 packs of this serum which I had given to my sister and sister in law and one to my mum and here I have one more pack of this. Lovely!! I use serums when my hair feel rough and dry as hair serums can be extremely beneficial in making the hair manageable and to reduce hair breakage. So, did I like February Fab bag? Of course, I did!! Without even thinking, this is a "worth it" bag and what else one can ask for at the price paid. The red bag is extremely beautiful and perfect, considering valentine month. I think I can gift this bag to any of my acquaintances. What say? Fabulous blog. 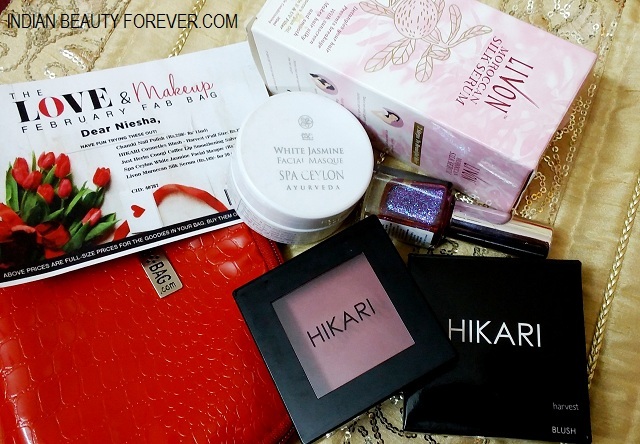 You can click at: http://www.couponsqueen.in/ for online shopping coupons. 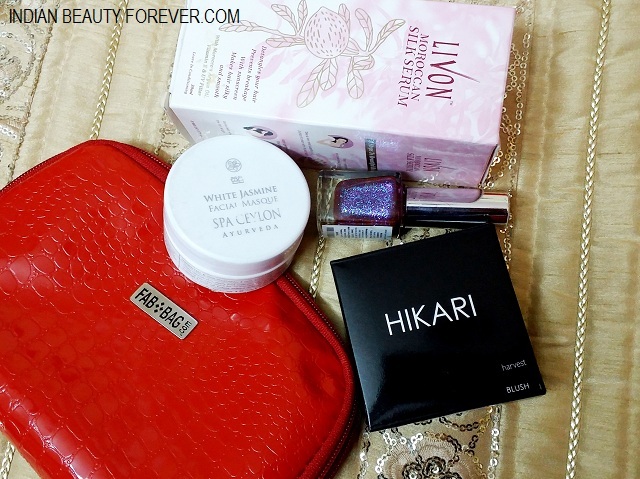 You have got some awesome stuff, the nail colour looks pretty. You've got some nice items. I'm eagerly waiting for my bag to come.